Maize is one of the most abstract and absurd games I’ve ever played. The sheer wackiness and creativity put into this game verges on something a child would’ve wrote in primary school, that a parent found then decided to develop into a fully fledged adventure game. The game is about talking sentient corn, a farm, an underground facility, and a unnamed character who must uncover the mystery of the talking corn. 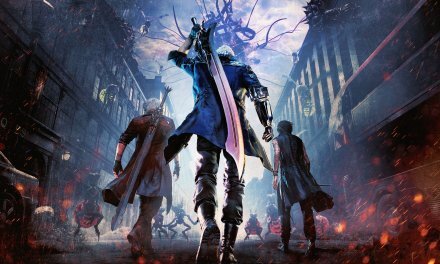 It sounds totally insane, but I surprised at how much I actually enjoyed this game. It’s got a balance of adventure, puzzles and comedy that comes together well, which – again, it’s a game about talking corn, how you make a game out of that I have no idea. 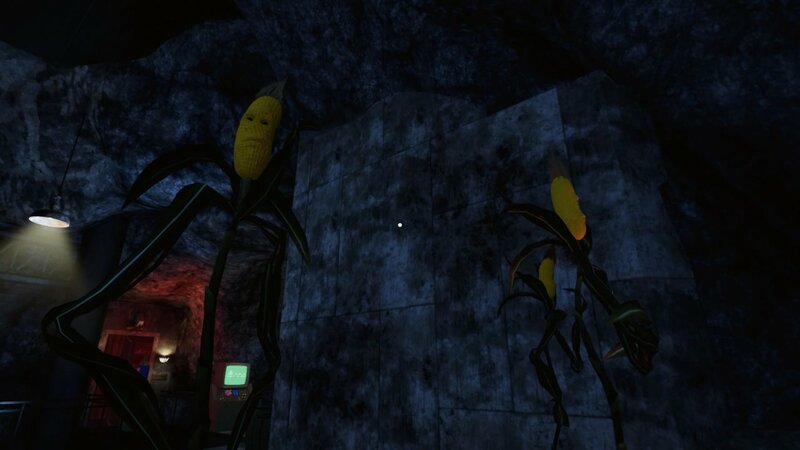 Maize is your standard first person adventure game, you walk around the areas, find objects, and use objects on other objects to unlock new areas. 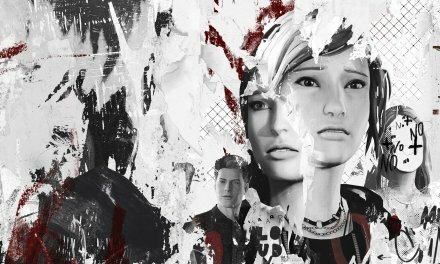 The game could’ve fooled me at the start though as for the first 20 minutes I was convinced it was a horror game. Walking around tight corridors of corn in a baron farm with spooky music playing, I was adamant some flesh eating corn on the cob was going to jump out and I’d get a game over. As I soon found out though, it’s quite the opposite. It’s a very silly, yet entertaining game as it uses a lot of comedy with it’s characters you meet and the dialogue it uses to describe items you find. The characters themselves are nothing groundbreaking but they made me genuinely laugh at their incompetence, idiocy and how they talk to the player. The corn stalks in particular were always fun to see and I swear they dropped a Monty Python reference in there too. Voice acting is one of the games strengths as each character has their own defined accent or trait, the villain in particular is probably the star of show and I always enjoyed the scenes he was in. The game relies on a slot of straight forward silly comedy, but it doesn’t come across as lazy, it’s pretty funny and descriptions of the items also gave me a chuckle. Throughout the game you’ll find ‘folio’ items, which don’t do anything, but are collectibles, each one with their own funny tagline, some better than others, but still fun to collect. 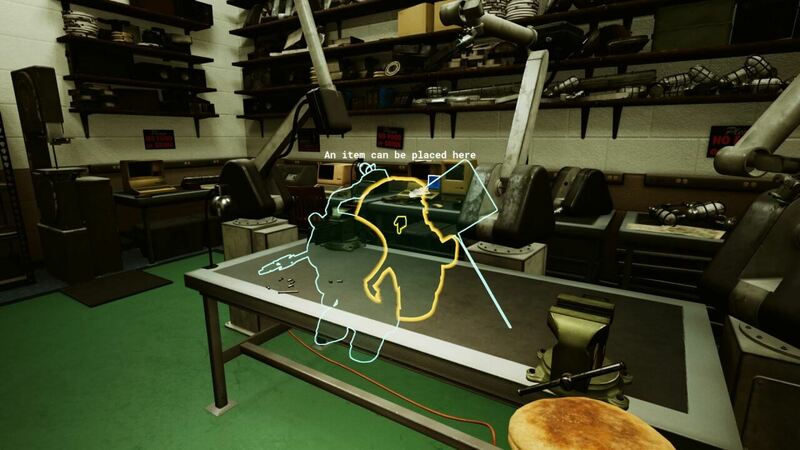 The gameplay mostly consists of exploring, picking up items, and using them on other items to move onto new areas. Rinse and repeat. But it doesn’t get boring, exploring the farm and its surrounding areas was always fun and I wanted to see what new crazy area I’d find next. Graphically the game is pretty, nothing over the top but they’ve done a good job with the lighting effects and gives a great sense of atmosphere. 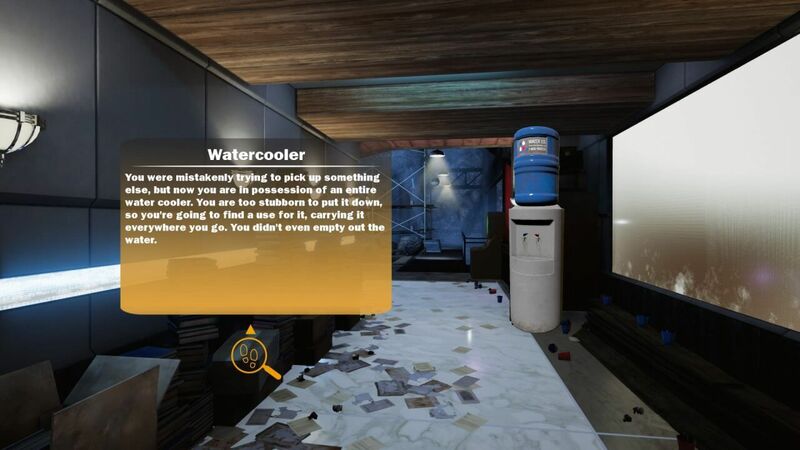 The game reminded me of Portal 2 to an extent, sadly we don’t get to use corn portals, but more so that you explore an underground abandoned facility and you are trying to find out what happened through minor clues you pick up along the way. Figuring out what item to use where gives you that sense of accomplishment when you figure it out, but can get a bit tedious. Figuring out what item to use where is way too easy most of the time, so you don’t really feel like you’ve figured it out as sometimes it will heavily hint where to use an item. On the other end though, finding items to use can take ages as you can just keep walking passed them. Late game I spent 20 minutes in one area trying to figure out what to do as I’d explored everywhere in the area, but couldn’t progress. So came the old adventure game trope of using every item on every available interactive object lying around to try and get anywhere. It turns out the item I was after was a tiny tiny piece glued to the wall and I’d walked passed it several times. I found in other games when stuck it gives you a pointer on where to go, or heavily implies you should go to a certain room or area and look there. Not Maize though, which really slowed the pace of the game when it’s just walking around the same places trying to find that one item. Enough to ruin the game? Not at all, this game is a lot of fun and the comedy alone is enough to recommend it to fans of basic adventure games. It is reminiscent of classic point and click adventure games from 90s PCs, find the items and use it on other items mentality has always been fun to me. When you find something and it clicks in your mind ‘aha! I know what this is for!’ is fun, and that’s what this game is. 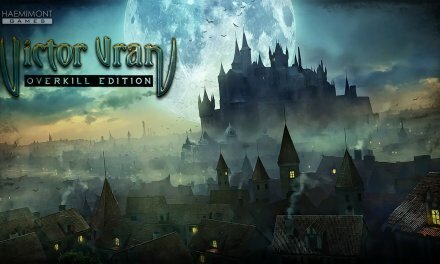 The story, dialogue, voice acting and comedic values of the game make this a fun game to play for around 4 hours or so. It is a bit basic, and I feel they could’ve done a bit more to make it a bit more advanced on the item puzzles, and a bit easier on the searching for the items all the time. But I as I said at the start, it’s a game about talking sentient corn, that on its own requires some merit. 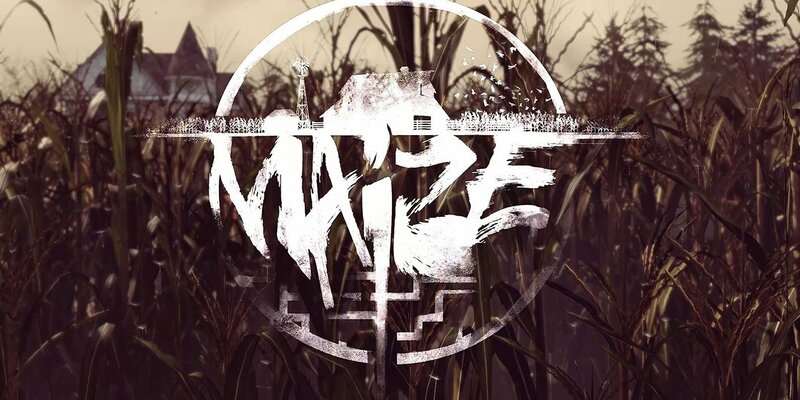 When it comes down to it, Maize is a fun daft adventure that you might not remember in a few months, but you’ll have a laugh and some fun playing it. Summary Maize is a lot of fun, it's a comedic game with some of the most abstract yet creative characters I've ever seen in a game, in a well rounded story. 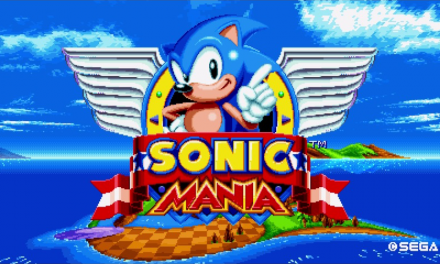 The exploring and puzzles are fun, but aren't exactly challenging, and the only challenge comes from not being able to find what you're looking for. But the moment you do find that item and you know what to do with it is one of those fun video game experiences that makes Maize an interesting and enjoyable game.